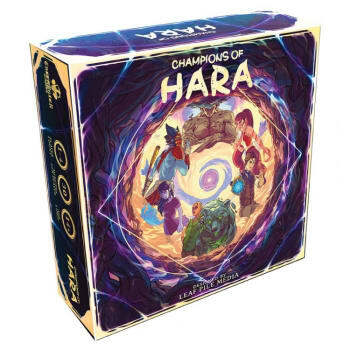 Champions of Hara is an adventure board game in which 1-4 players race to protect a dying world. Players will contain destructive energy by defeating monsters, closing rifts, and exploring the six different worlds within Hara. In order to rise to the challenge, players will need to unlock new abilities and collect powerful items. In versus mode, players will compete against one another in arena style combat. In co-op mode, players will work together to overcome corrupted foes and solving scenario based challenges.